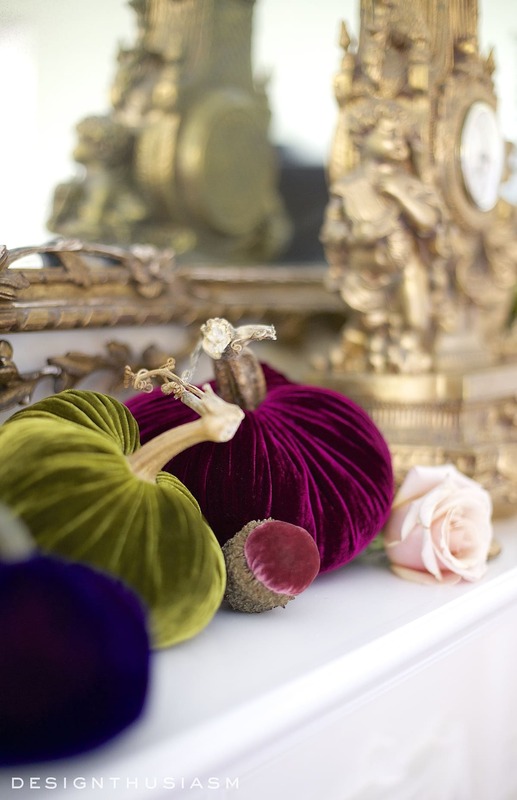 I hinted a while back that I had something else planned for those luscious velvet pumpkins and here it is. 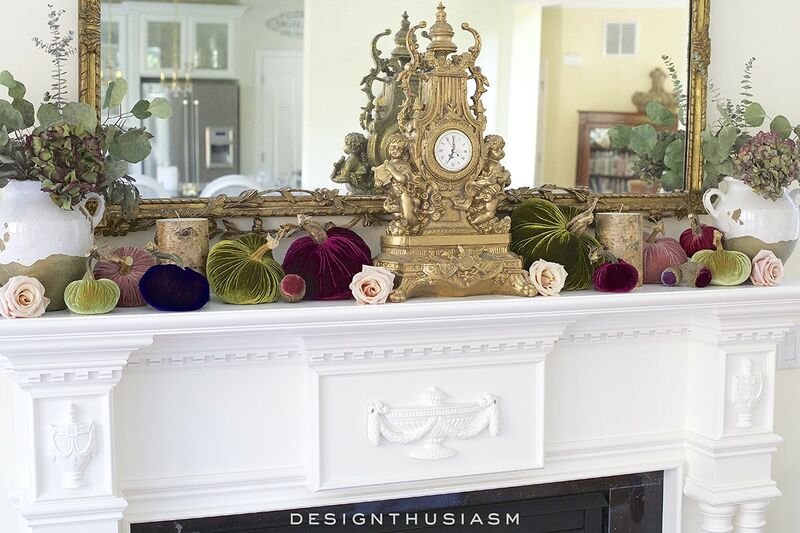 Our open plan kitchen and family room call for some seasonal decor when holiday guests are coming, so I’ve put together an autumn mantel with velvet pumpkins for Thanksgiving. While dinner will be served in the dining room on the other side of the kitchen, we often do drinks and hors d’oeuvres in these two joined spaces. The more festive, the better! 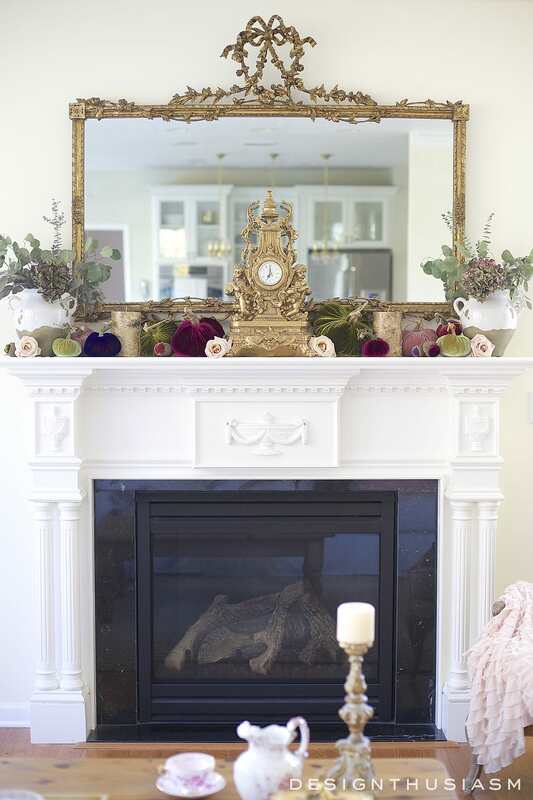 Our family room is a casual space with some formal accents and that’s exactly the mixed approach I take when decorating the mantel. 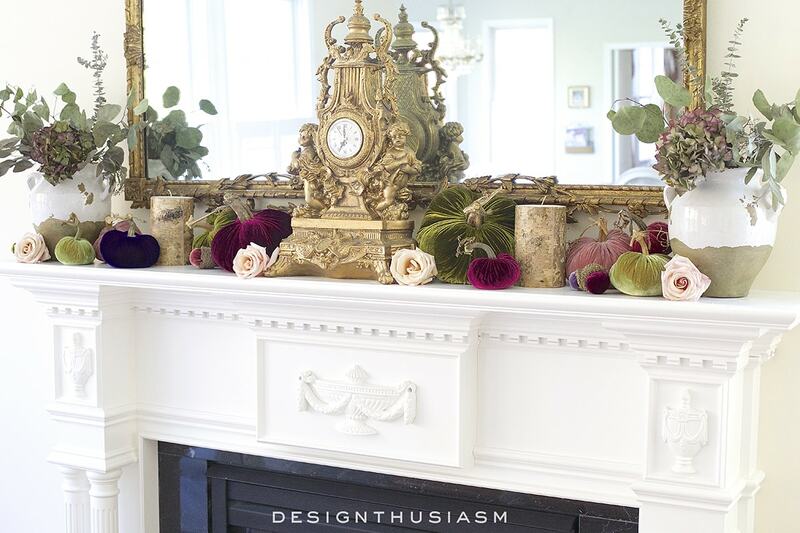 We installed this mantel when we moved into our home and it has a very classic feel that can be dressed up or kept very simple. 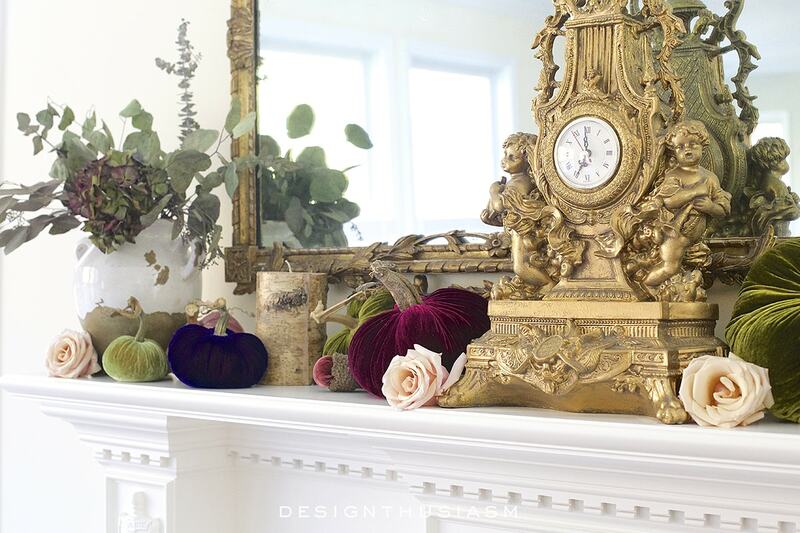 The gilded clock acts as an anchor and is certainly one of the more embellished elements in the room. The rich sheen of the velvet pumpkins plays well off this ornate clock, and yet their bean bag slouch sends a relaxed message which also sits well with the birch bark candles. The casual mood is further enhanced by the chippy painted Tuscan vases. 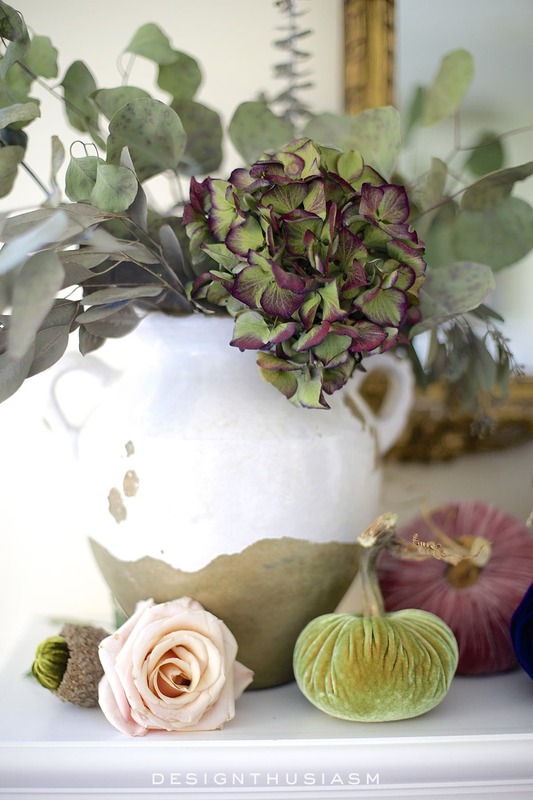 Dried hydrangeas and seeded eucalyptus are the perfect match for this autumn display. 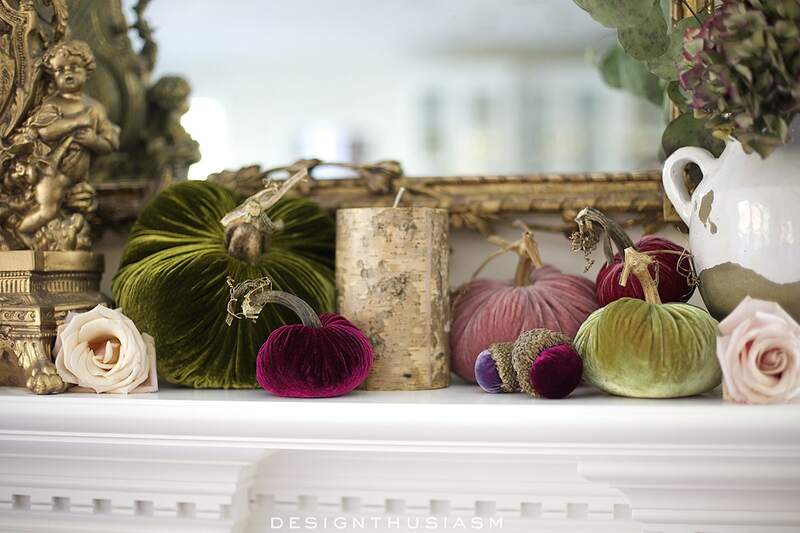 Velvet acorns are an adorable addition to the tossed-about look of the scattered pumpkins. 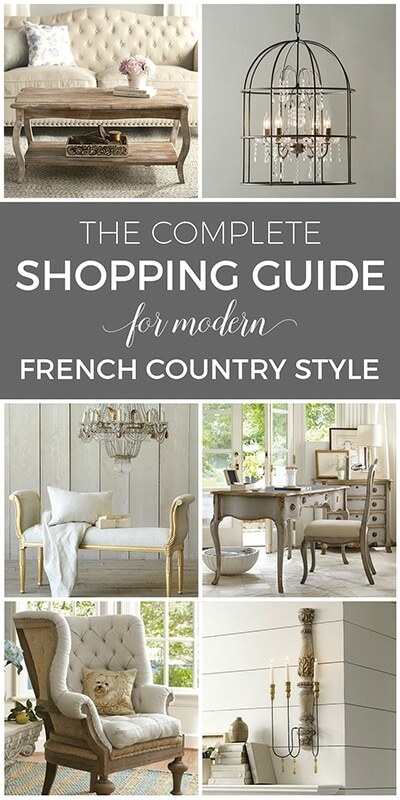 Framing the scene is another more formal component, the antique French mirror with delicate detailing. 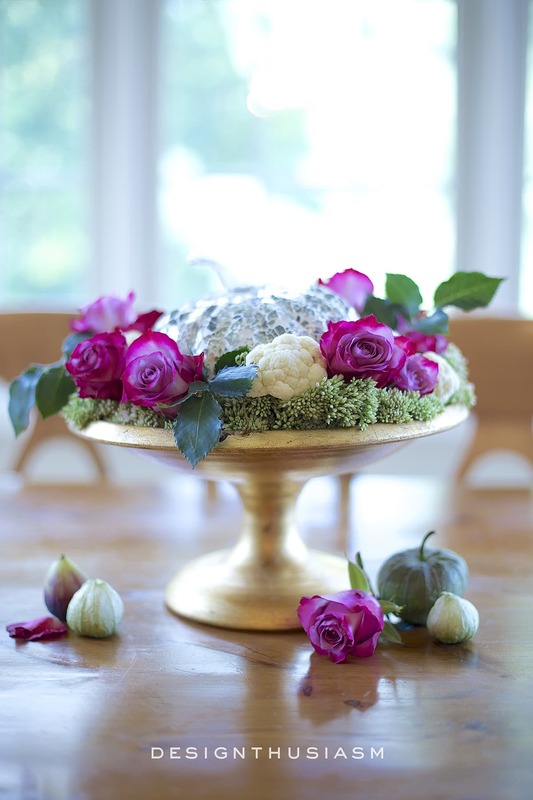 Pale pink roses are tucked between the bolder pieces, creating a softening effect. I’m delighted that my mirror finally reflects my white and glass kitchen and we’re no longer looking at dark closed cabinets. The adjacent rooms work so much better together now. I’ve been so romanced by these sweet little pumpkins but after Thanksgiving it will be time to put them away. I love the way they seem to dance across the mantel shelf. The textures and colors really benefit by the light and this room is blessed with many windows throughout. 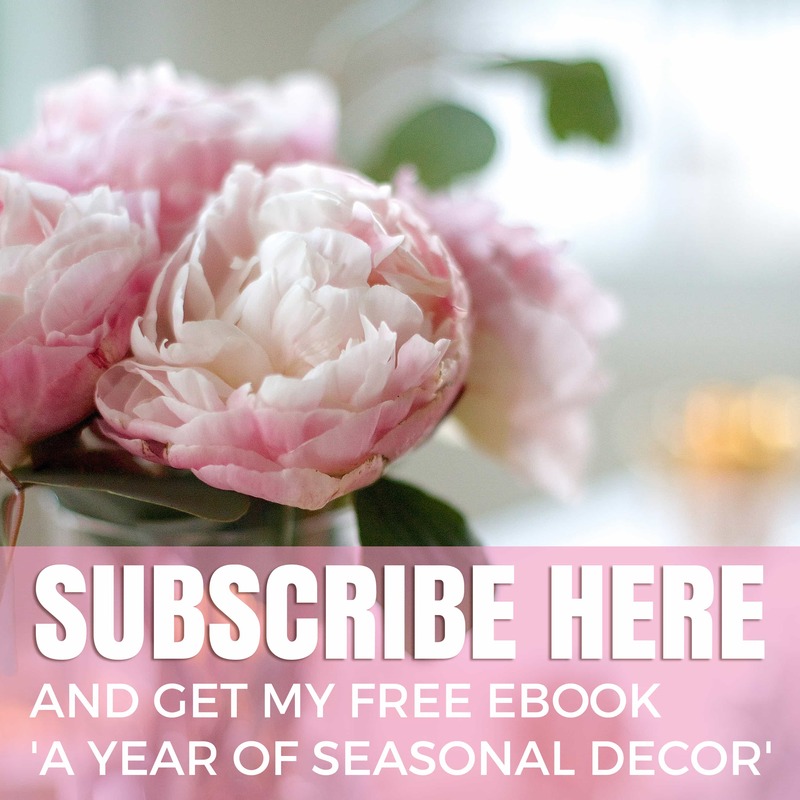 I love to decorate seasonally particularly when guests are visiting. 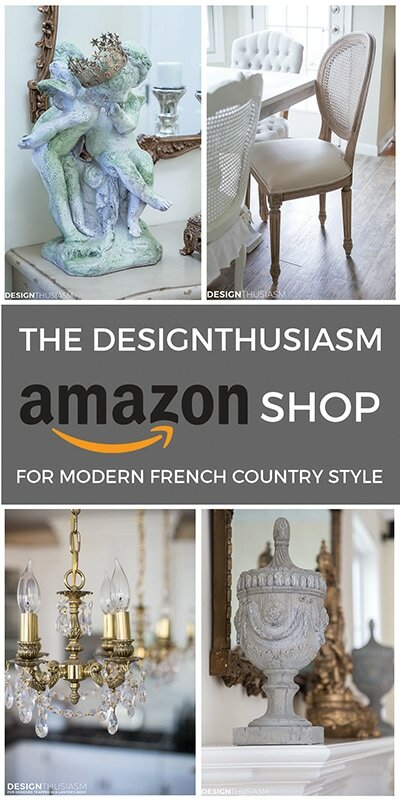 It extends the mood of the table throughout our home. 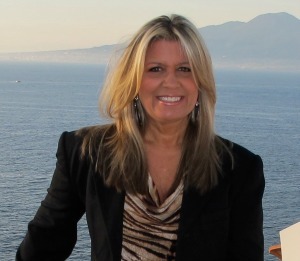 I wish you all a very Happy Thanksgiving, spent with loved ones and blessed with plentiful joys!! Gorgeous I love all the colors of your luscious velvet pumpkins. Happy Thanksgiving. Thank you, Marty! Happy Thanksgiving to you, too!! Thanks so much, Rose! Happy Thanksgiving to you, too!! 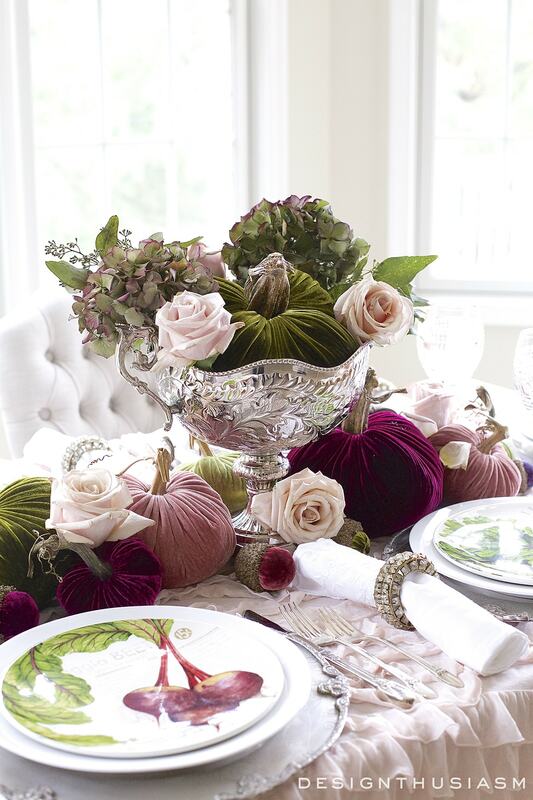 Hi Lory ~ I really love the soft lavender and sage and purple plush pumpkins you’ve chosen for your mantle. 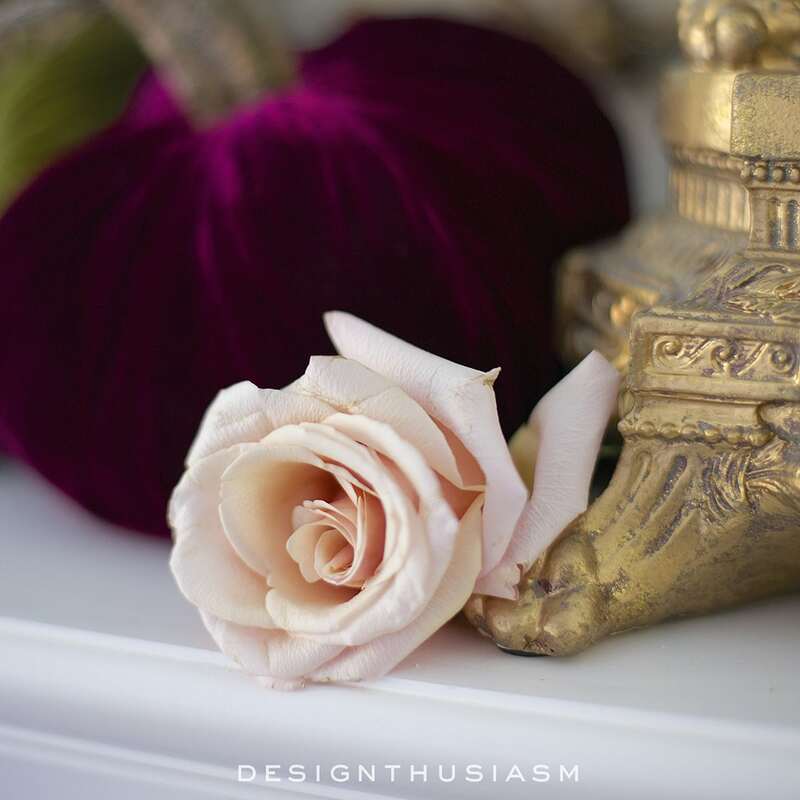 Then placing the soft pink roses among them is just delightful to my eye! I didn’t realize how harsh, by comparison, the colors of orange and brown are to me. I’m happy not to see those harsher colors! Anyway, I like your softer take on a Thanksgiving mantle. Oh, and I agree with you ~ I like your new white cabinets reflected in your beautiful French mirror, too! Thanks for sharing your beautiful spaces and Happy Thanksgiving to you! Thank you so much, Leila! Happy Thanksgiving to you, too!! 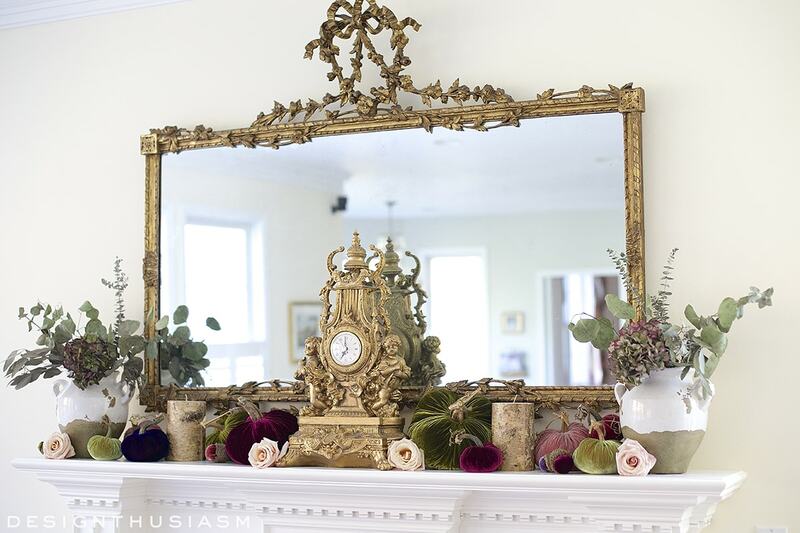 Oh, Lory, your mantel is absolutely beautiful! 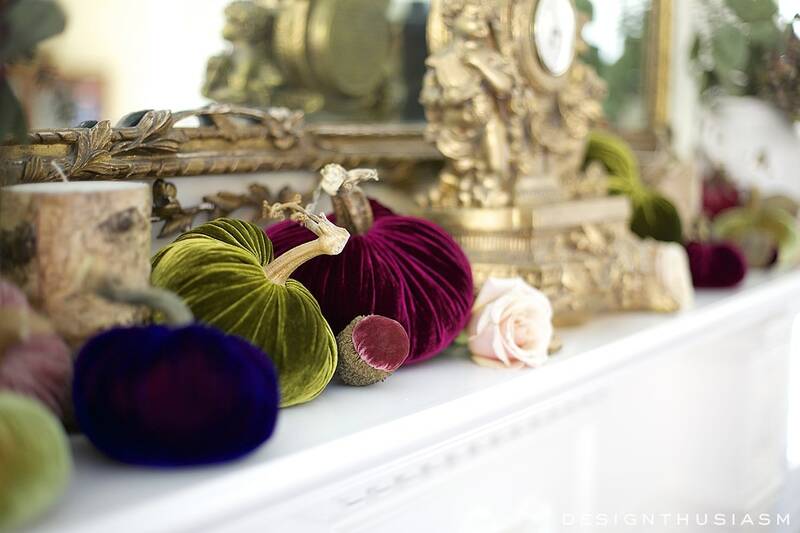 I have been lusting after these velvet pumpkins for ages now but I know they would not look as stunning as they do in your interior. 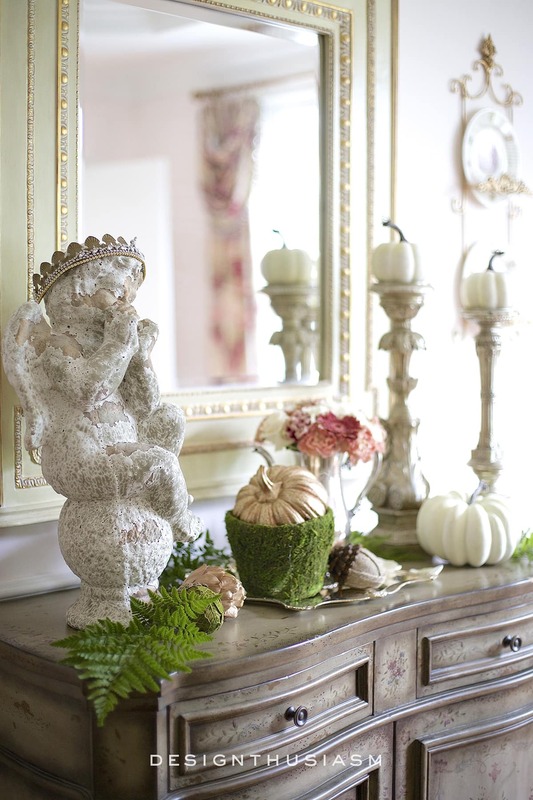 Your home is the perfect palette for displaying these elegant pumpkins. The tiny acorns are so cute too, I have never seen them before! I am wishing you and your family a blessed Thanksgiving! Thanks, Chloe! The pumpkins come in every color and would go great in your home too… 🙂 Have a wonderful Thanksgiving!! Your pumpkins are so gorgeous. I love them on your mantle piece and on the table. I need to do more but I need stems. I’m puzzled at your acorns, I’ve never seen such big acorns. I really love them. Do you know the name of the oak they come from? 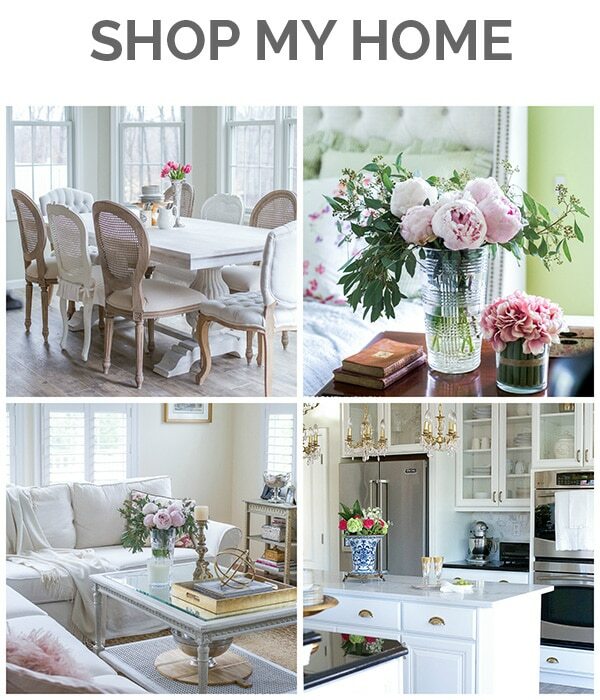 I love the colors of your lovely blog. Thank you, Daniele! The acorns are velvet too and come from the same company as the pumpkins. Happy Thanksgiving! 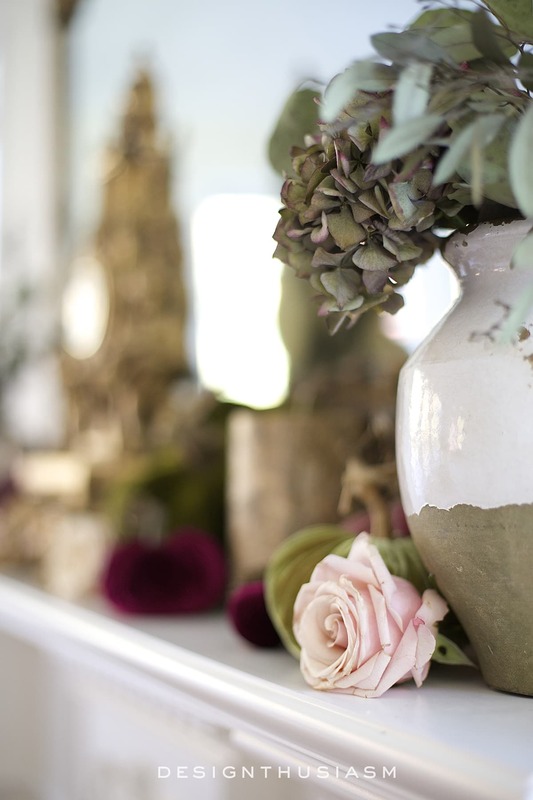 I loved them on the table, and love them on the mantle! Did I miss your final decision on which tablescape to go with? Of course, whichever you chose will be gorgeous. Perhaps a little touch of them all? Have a wonderful Thanksgiving! We all have so much to be grateful for. Love what you have done. The color scheme is so pretty. I have the velvet pumpkins on my table and they just add so much to the table. What did we do without them!! Wishing you and your family a Happy Thanksgiving and many continued blessings. Thanks and right back to you, Diane! Lovely! And oh, so elegant. I am thrilled to see something other than the traditional red, gold, rust, brown and green for Thanksgiving decorating! As I look out at the (upper Midwest) morning landscape, in its final farewell to the Fall colors, I’m ready for your refreshing purples and greens to lead us into the Christmas season! Beautiful!